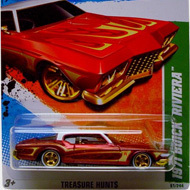 10/15 from the 2011 Super Treasure Hunt series. 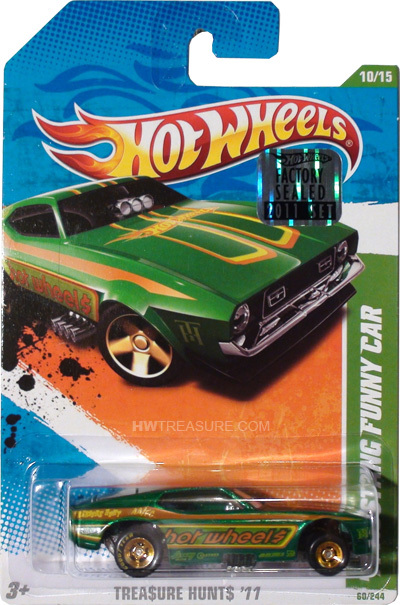 The Mustang has green Spectraflame paint emblazoned with orange, yellow and green stripes. 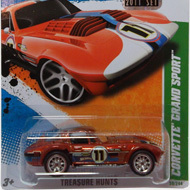 There are “hot wheel$”, “TH”, and “TREASURE HUNT” on the sides, the Hot Wheels logo on the hood, and other graphics. It has clear windows, an unpainted metal interior, Real Rider Mag wheels with gold chrome rims, Goodyear tires, and an unpainted metal Malaysia base.